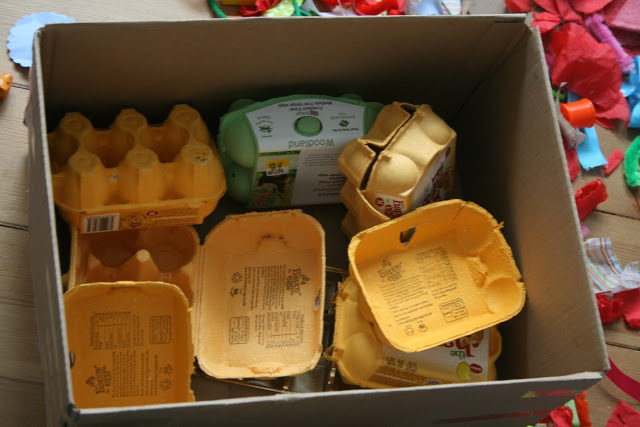 I gave the girls a big box filled with egg cartons and just sat back to watch them and talk to them as they decided what to do with them. This was a fun Discovery Box! Both girls played with it at their own level and were creative in their thinking, which is exactly what I’m hoping for every time I introduce new materials. 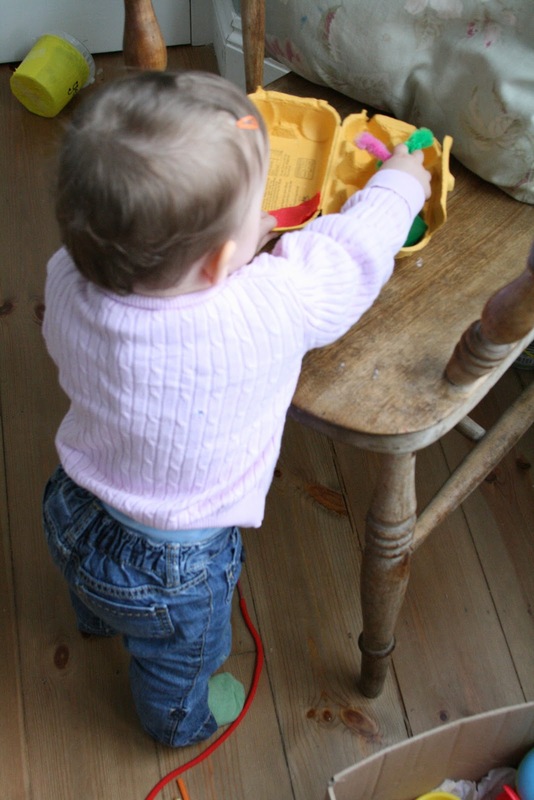 Children just know how to play with everyday things so instinctively! 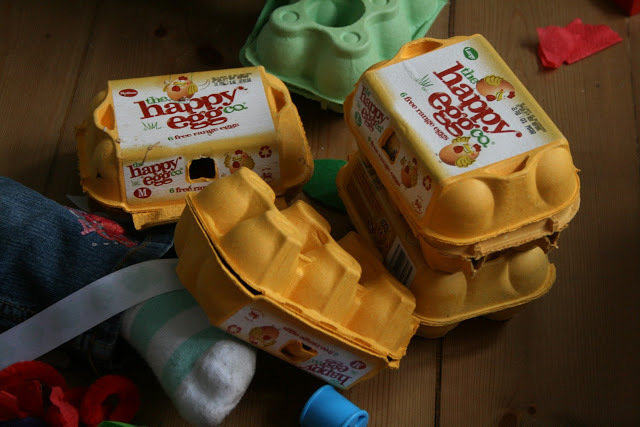 Of course the first thing to do was dive right into them and throw them all over the living room floor! Little Pop spent a good while opening and closing, opening and closing. Repeating and learning. Cakie worked out how they closed and had to be pushed in slightly to re-open. 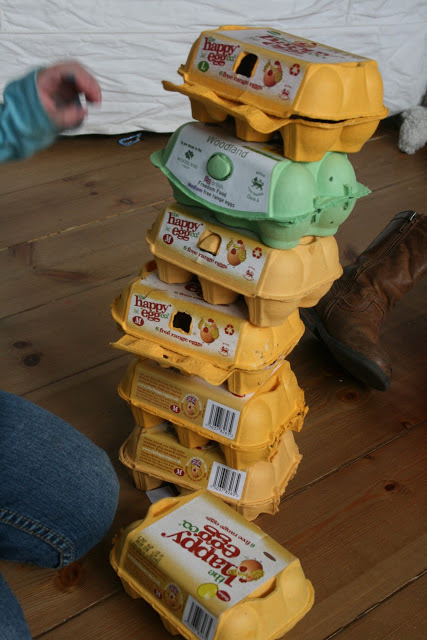 Then she closed them all and started to use them like building blocks, stacking them into a tall tower. When she got a chance to finish stacking without Demolition Baby interfering, she laid ribbons on top to decorate it. Baby looked on in interest, but spent most of her time emptying out the contents as quickly as C could fill them up again! 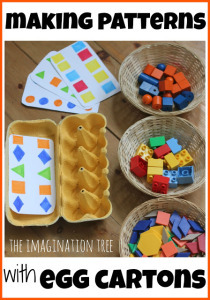 I have started to leave out the Discovery Box materials in a basket/ container for future play as I realised I wasn’t giving them enough time to come back and revisit the play again. 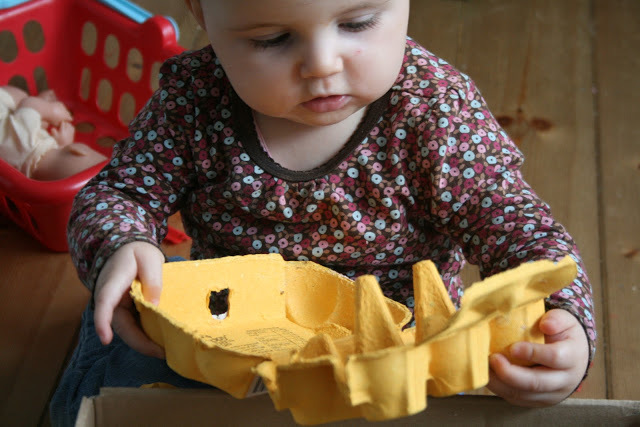 This is so important for giving children a chance to build on and consolidate previous play experiences, and also to branch out into new ideas and creative projects. And here is what baby Pop did a few days later! 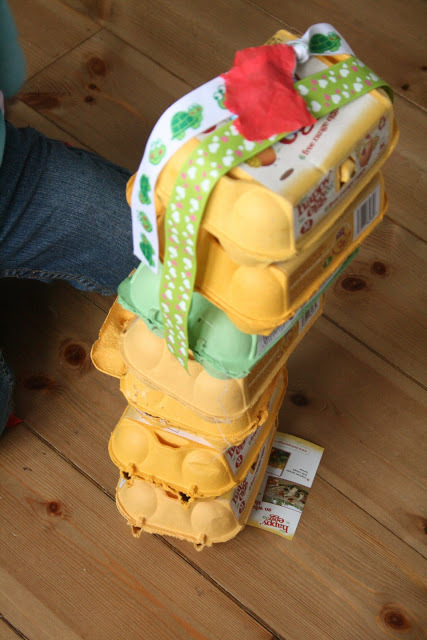 She found herself an egg carton, put it on a chair and stood up so that she was at the right height. 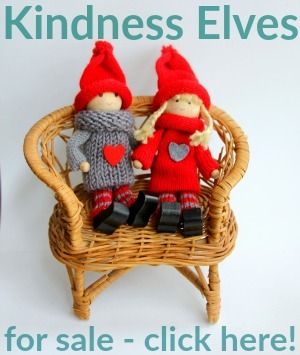 Then she scooted off to collect handfuls of goodies from the rummage box and brought them over to the chair. 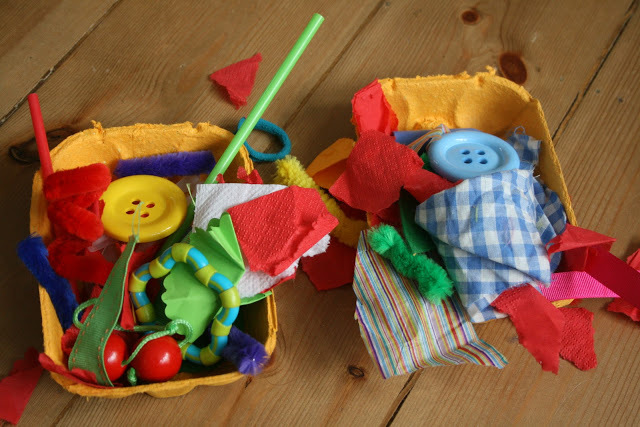 Then she made her own little collection of things in the carton, carefully arranging them in each section, filling and emptying, opening and closing, shaking the box and laughing, then tipping all the bits out and starting again! A lovely example of building on her previous play experience and imitating big Sister’s ideas. 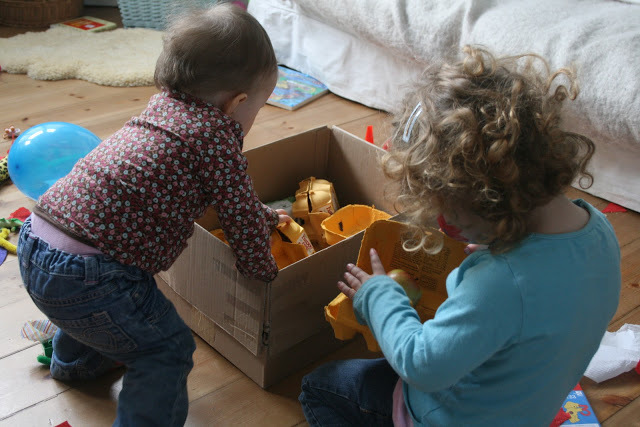 Read about our other Discovery Boxes here. How funny! 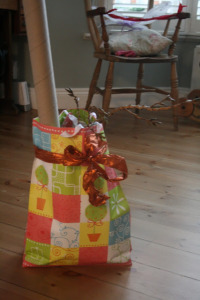 I had a paper bag full of egg cartons that I’d been saving for Easter crafts and my two girls (very close in age to yours – 12 months and 3 3/4) got into them just the other day. They had a great time too! 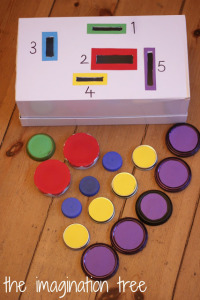 The simplest things really seem to interest them the most – and you are so right, they come up with much more interesting forms of play if you just leave them to figure it out themselves. I love the part about your little one copying her sister’s play from the day before – so sweet to see them doing that! I caught my little one copying her sister drinking today – picking up the cup whenever big sister did, drinking from it at the same time, and putting it down again when her sister did. I love this age! Thank you for the discovery box idea. also i had a large stack of egg cartons and every time i looked at them my mind went blank except for ” caterpillars’. Great to get fresh perspective. 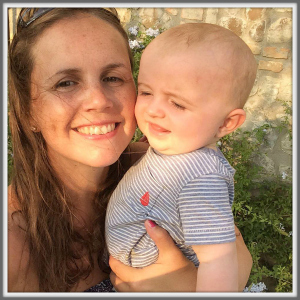 I love your discovery box idea… I am keen to do something similar for my 9 month old, just a collection of household bits and pieces for him to explore! Terrific post! And, a very good idea to leave them out for further play. 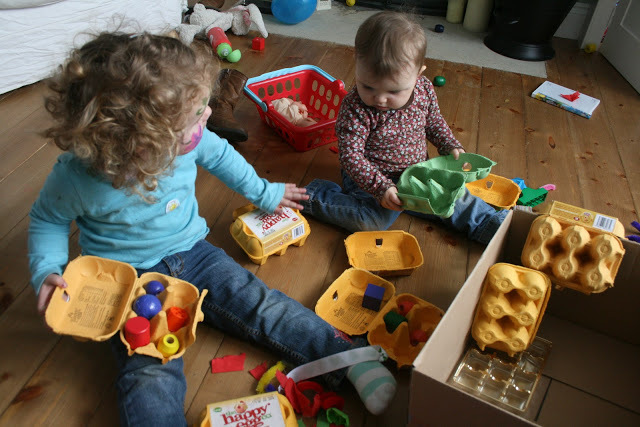 OMG I’d have never ever thought of giving them egg cartons for free play but it worked out wonderfully. Thanks for posting I am fixing to check out some more of your discovery boxes. I’m liking this! 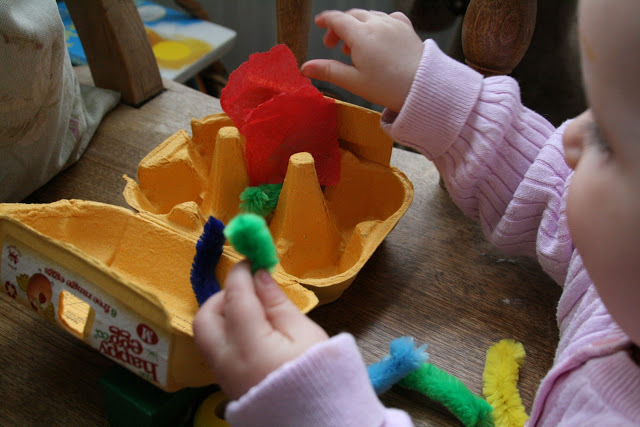 We have played with sensory tubs, but I haven’t heard of discovery boxes before! What a fun activity!